I’ve been looking for some good appetizer recipes to serve Super Bowl Sunday, and this Marinated Olives and Feta Cheese will definitely be on my table! I was actually looking through an old magazine this morning, looking for something that I could make in order to join Debbiedoo’s copycat linky party. 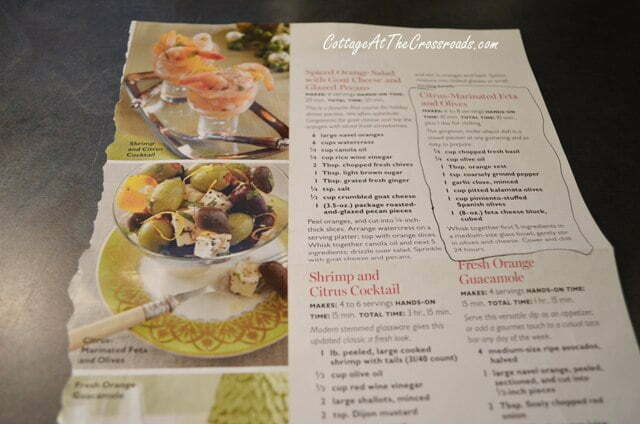 I ran across a recipe in the December 2011 issue of Southern Living. Initially, I ripped it out of the magazine to add to my stash of recipes that I save before disposing of older magazines. But when I looked at it again, I decided this would make a good appetizer for the Super Bowl, and I could use it to join the copycat party. So off to the grocery store I went with my ripped out page. To make this appetizer, I used: a (4.5 ounce) jar of pimento stuffed olives, a (4.5 ounce) jar whole button mushrooms, a (10.2 ounce) jar pitted kalamata olives, 1 (8 ounce) block traditional feta cheese, a (14 ounce) can small artichoke hearts, cut into rounds, 2 cloves garlic, 1/4 cup olive oil, 1 orange and some fresh basil. 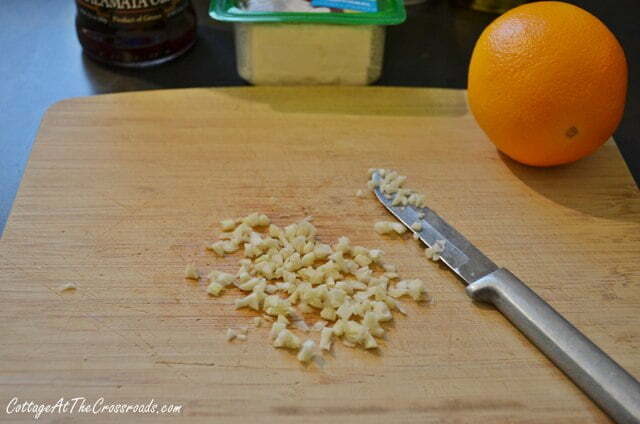 First, start by mincing the 2 garlic cloves very finely. 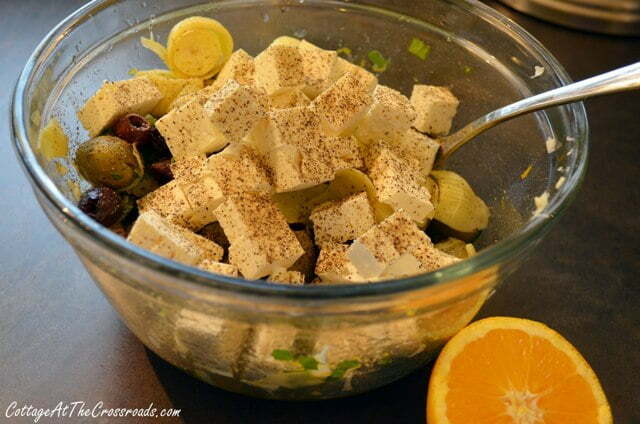 Cut the block of feta cheese into cubes, add those to the bowl, and sprinkle with black pepper. Gently stir together. The directions said to cover and chill for 24 hours before serving, but after I finished photographing it, Leo and I devoured it. You might say that you could buy some marinated olives at the deli bar, but it is the orange zest and the orange juice along with the fresh basil that gives this dish its unique flavor. Oh, and I have to tell you that I tweaked the original recipe. It didn’t call for mushrooms, artichoke hearts, or the orange juice. But trust me, the orange juice makes all the difference in the world! We will be watching the Super Bowl and enjoying this appetizer. This is my cousin, Andy Lee, who is the punter for the San Francisco 49ers. He not only punts, but he’s the holder for extra points and field goals. His parents sent my mother this autographed picture of him. So when you see him during the Super Bowl, you can think about the Cottage at the Crossroads and you’ll have a special connection to the game, too! This looks and sounds delicious, Jane. I can’t wait to try it! This was just as good as you said that it would be!! The orange juice is a perfect touch! Enjoyed this recipe very much! Thanks for sharing with us!!! 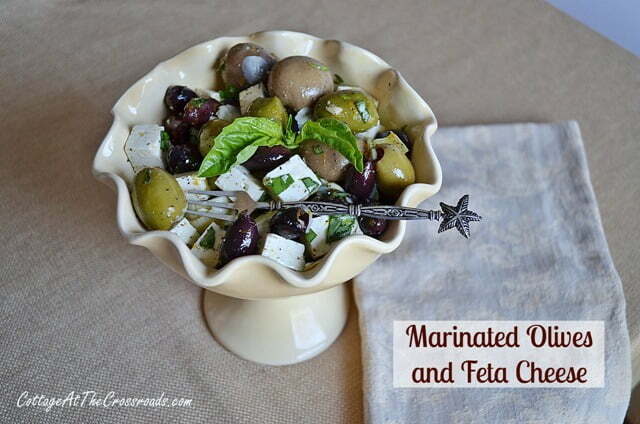 I love olives and feta, this looks and sounds amazing! I think I’ll add it to my Super Bowl line up! I’m addicted to olives and I’m all about the easy appetizer! How cool to have a cousin in the Super Bowl! 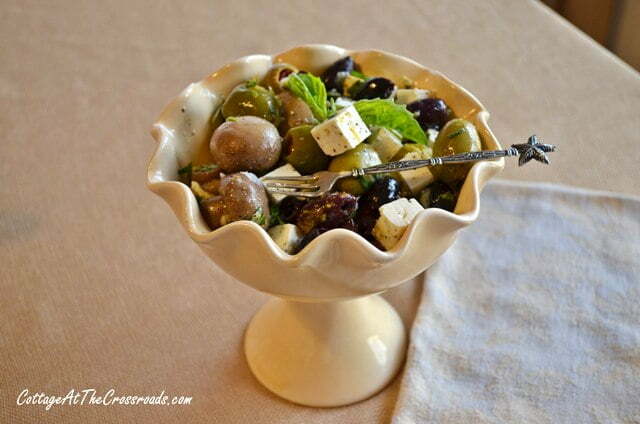 Jane…we love the combination of olives and feta….your recipe looks amazing. And good luck to Andy…how wonderful it must be for your family to cheer him on to victory!!…. Your appetizer looks delicious Jane! 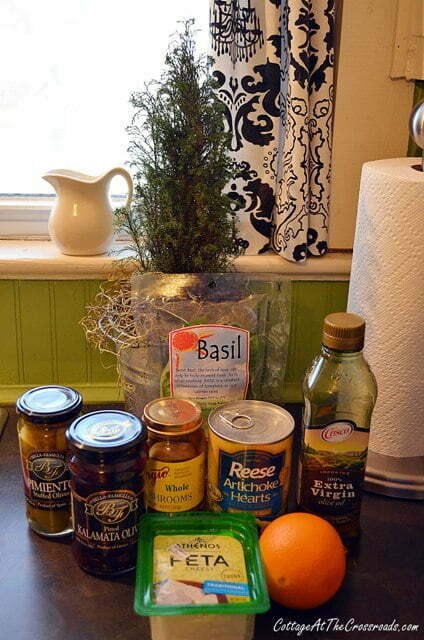 I love the addition of the orange juice & zest and the make ahead factor is right up my alley! Looks delicious! I could eat some right now! Oh yum, this sounds so delicious, Jane! Love olives, feta — well, pretty much all the ingredients! Thanks for sharing! I will be watching Downton Abbey, but maybe I will make some hors’d for dh! I will have to do a post of some easy apps for Sunday. Well, I love olives and feta cheese. I imagine that the orange juice, artichokes, and basil would be a wonderful addition to the appetizer. I am not a lover of mushrooms so I would probably forgo them. This recipe looks wonderful! I love olives and feta cheese. This looks wonderful Jane. That is a great photo and I know you will enjoy the Super Bowl. This looks fabulous. I can see why you and Leo did away with it so quickly! My grocery lists are usually on the back of an envelope or random piece of mail so I totally relate to your ripped out page. I wish I had prepared a copy cat post…everyone’s has been so fun. Have a good week! Yep, I was thinking the same thing…..Just in time for the Super Bowl! Folks tend to “graze” during the game, and this recipe is perfect for that. Thanks for posting the recipe! This sounds so yummy!! Must try this! Wow!! You have a special connection to the game!! May have to watch it now! Gosh I love this…so my appe right here! Thanks for sharing Jane. The 49ers are going to win hands down . How yummy and the bowl you used is just perfect for a photo.